As the MLS season enters its final phase–the MLS Cup Playoffs–rumors have begun to surface of Premier League teams having their eyes on America’s best players for the January transfer window. 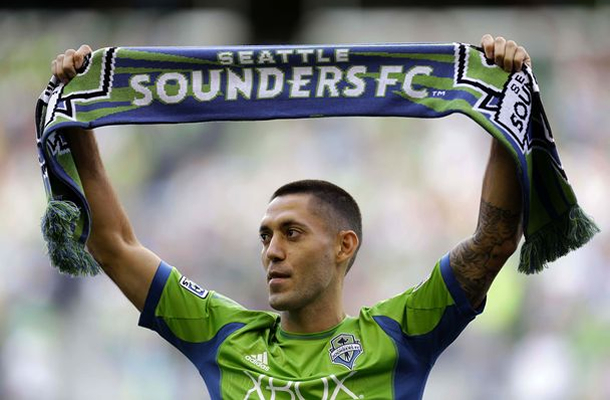 Right now, one of the big names being kicked around is that of Seattle Sounders FC and USMNT Forward Clint Dempsey. With his 15 goals and 10 assists, Dempsey is a huge reason for Seattle’s run to the MLS Supporters’ Shield, so it’s nice to see him get some recognition, but this potential move does raise a lot of questions. Where will Dempsey end up, and what impact will he have on both sides of the pond? Let’s take a closer look. First of all, let’s examine the rumors themselves. It appears that at least three different Premiere League sides are interested in bringing Dempsey across the pond: Queens Park Rangers, Stoke City and Aston Villa. QPR is a storied franchise that has fallen on hard times. Since the turn of the century, they’ve struggled to stay in the top flight, earning promotion and suffering relegation a few different times and recently suffering through a period of severe economic downturn. After being relegated after the 2012-2013 season, they rebounded with a strong 2013-14 season, and are now back in the Premier League. However, they have struggled mightily through their first nine games, earning only 7 of a possible 27 points, and they currently sit in 19th place. That puts them only ahead of Burnley, and smack dab in the middle of the relegation zone again. They probably feel that Dempsey could cause a couple of more bounces to go their way, and help them avoid relegation again this year. Aston Villa isn’t fairing that much better, as they sit in 15th place on the table with just 10 points. They actually missed out on a chance to jump all the way to 8th place (or 12th place at a minimum with a draw) by losing 2-0 to QPR during the Monday night game. It marked Villa’s fifth straight shutout loss, so you know they’re pretty desperate for offense. Like QPR, they have a pretty solid history. Villa are one of just five English sides to win what is known today as the UEFA Champions League (formerly the European Cup), doing so during the 1981-82 season, but have seen little to no big time success since. Villa is currently owned by American businessman Randy Lemer, who also owns the NFL’s Cleveland Browns, and feature USMNT starting 11 hopeful Brad Guzan in net. This is another team that, if a couple of things don’t go their way, could find themselves in the relegation zone, so they’d be hoping Dempsey can help them steady themselves in the middle of the Premier League table for the rest of the season. Dempsey is already pretty familiar with the Premier League. Finally, we have Stoke City. Stoke are in the best position on the table of all three of these teams, but they sit at 12th place with 11 points (tied with Tottenham and Hull City), so that’s not really saying all that much. That being said, they’re only five points away from the Champions League spots through the first nine games. Now, no one expects them to make Champions League, or finish anywhere other than the middle of the table, but Dempsey could help them make a run that would excite their fans. Also, fellow USMNT member Geoff Cameron is also on Stoke, so Dempsey would have a fellow Yank to run around town with if he goes there. For those of you worried that Dempsey might get “stolen” by one of these teams, fear not. The rumors definitely say that this will be a loan, if it even happens. This also won’t be the first time that Dempsey heads over to England during the MLS offseason. Just last year, he was loaned out to Fulham for five games during the winter. That’s actually one of the reasons why people think that the 31-year old from Nacogdoches, TX should not go to England this Offseason. If you count last year’s MLS season, his time in Fulham, this year’s MLS season and the World Cup, the guy’s basically been playing for a year straight. Maybe he should just take a couple of months off and rest his legs? He’s not exactly a kid anymore, and will be needed for the USMNT’s Gold Cup run in 2015 and the special Copa Ámerica in 2016. The other school of thought on this is that he’ll only get so many years out of his body, and should make his money while he can. Also, maybe he just likes playing in England–he does have 218 PL games under his belt already. Also, we all know Jurgen Klinsmann would want him playing in England, but would the Sounders want this again? They, and MLS, are paying him a ton of money to be one of the faces of the league, especially now that Landon Donovan is retiring. It would be terrible if he were to end up too burned out to contribute to Seattle’s 2015 season. Whatever Dempsey chooses to do, he should just make sure he’s doing what’s best for him. I think this type of thing is actually good for MLS. If more and more European teams start looking to the MLS offseason for addressing needs, and they use “face of the league” type guys, it only ads legitimacy to what MLS is doing. I think that, as the league grows in popularity and talent level, this type of winter loan will become more and more common, which will help spread the name of Major League Soccer all over the world. This will not only attract more teams to poach the league, it will also attract more European players to MLS. It’s a game of give and take, and I think it’s very healthy. I, for one, am interested to see what Clint does, and also to see if other American names start coming up in January.